Ahhh, one of those days when I am lazy to cook....., a big pot of soup with 'hampalang' (everything) inside is always the answer. After checking out my fridge, I found fish maw, fresh mushroom, cabbage, a leftover Yau Char kueh from breakfast, coriander leaves and pork ribs. All these ingredients would be suitable for a hot pot of soup. Put water in pot and bring to a boil. Add in the pork ribs, garlic, yuk chuk and tong kwai. Boil for around 45 to 60 minutes or until the pork ribs are soft. Add in cabbage, fish maw, fresh mushroom, salt, light soya sauce and dark soya sauce. Boil for a short while. Garnish with coriander leaves and serve while still hot. Throw in the Yau Char Kwai and let it soak up the soup.....nice! 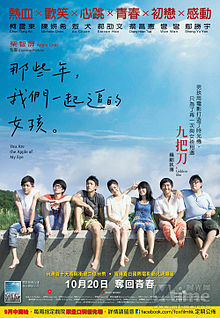 You Are the Apple of My Eye (那些年，我们一起追的女孩 - 那些年, Na xie nian wo men yi qi zhui de nv hai - Na xie nian) is a popular Taiwanese movie about romance between a mischievous high school boy, Ko Chen-tung (Ko Ching-teng) and a girl, Shen Chia-yi (Michelle Chen). My kids love the show very much but I just watched part of it only and missed the ending. Anyway, it sort of reminds me of my naughty school days, chasing 'butterflies'.........Ahem!....lol! The video shows my eldest son attempting to play this very long song Na Xie Nian (那些年) on the piano. Not perfect, with some errors here and there; need more practice. However, hope you enjoy the music. Have a nice weekend! Finally finished editing this video after much fiddling with Windows Movie Maker! My little five year old loves PSY Gangnam Style music video and I wanted to make this parody video with my family in it so that they can remember all the good times we had together. My daughter took most of the videos with my youngest son as the main star or you can say......Spiderman....., correction....Spiderboy! Michael Jackson pun ada (also got) lorrr.... LOL! Ok, ok, ok, I know that some of you might have been tired of hearing too much Gangnam Style music but I guess no harm to hear it one more time with Pete and kids in it (Published at my Youtube Account, Peteformation L)! Turn on your speaker! Enter the Gangnam Nunchaku Style with Pete's Family! Boy, I sure looks old liao.........ha ha ha! PS : Thanks to PSY, YG Entertainment for producing such a catchy song. Whenever I watch Western cooking show, I am always amazed how simple the chef marinade the steak they are cooking. Most of the time they just use pepper and salt. Actually, this simple marinade maintain the natural flavours of meat and is real tasty if you cook it right. The addition of various sauces enhances these flavours more. I tried cooking lean pork with just pepper and salt. Since I wanted to char the meat a little, I used non-stick wok with no oil. I added leeks and onion so that I do not have to cook another vegetable dish. Anyway, leeks always taste good with pork. Marinade pork with salt and pepper. Heat up non-stick wok and put in the marinated pork. Fry at medium heat until they are slightly burned. Add in the onions and fry until they are slightly brown. Throw in the leeks. Stir fry for a short while. Serve while still hot. Note : You can make some sauce to go with this dish which is rather dry. PS : If you want a tastier dish, use pork belly with a layer of fat on it........mmmm, nice! 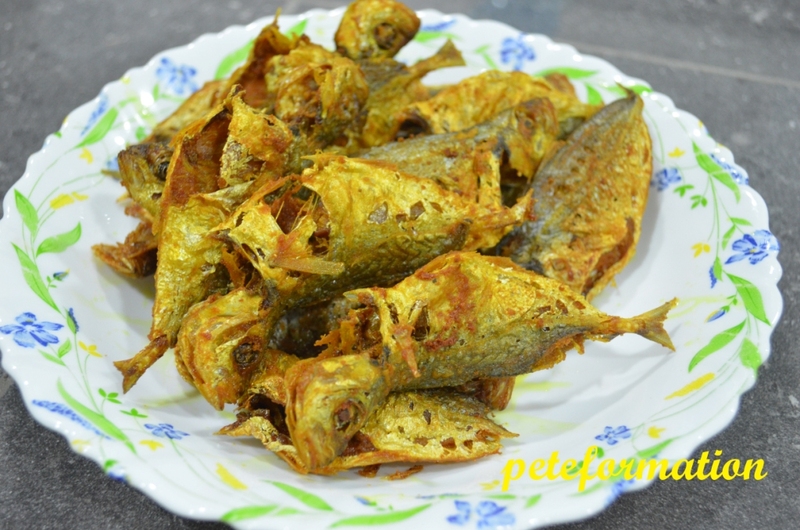 I have posted quite a few recipes on Ikan Selar Kuning (Gold/Yellow Banded Scad Fish). This is one of my favourite fish and I would buy them whenever I come across this fish at the wet market. 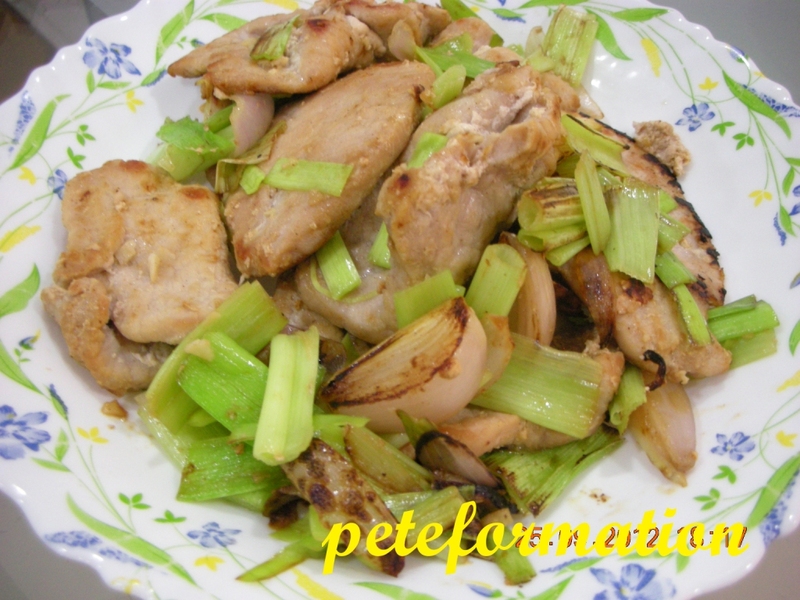 This recipe is rather simple but frying the marinated is a little messy. In order to avoid the hot oil from splattering all over the places, I covered my wok with a lid and open it a little from time to time to allow the water vapour to come out. Marinade the fish with all the ingredients and leave it for 20 minutes. Heat up oil for deep frying and then fry the fish till they are crispy. Serve while still hot. Sure taste good with Nasi Lemak! Actually I was rushing to cook dinner when I prepared this dish. I had a container full of 'butterflied' prawn in my fridge and the fastest way to cook them is to throw them into the oven. I added in some brocolli and Tomato to this dish, so that I do not have to cook any extra green vegetables. he he he, All in one! LOL! This is a real easy dish to prepare. Here is my Hickory Cheese Baked Prawns with Broccoli recipe. 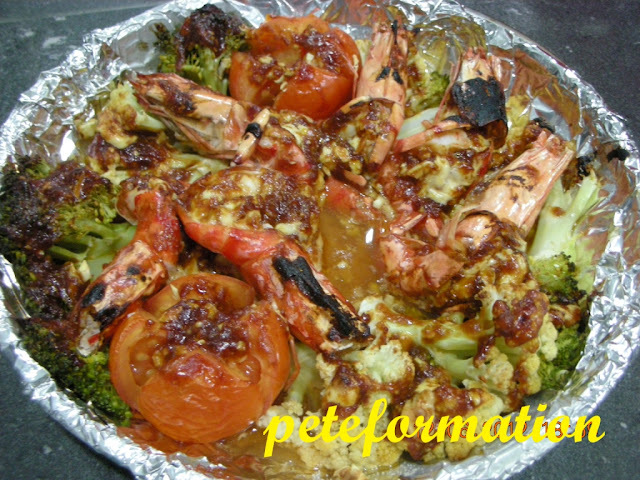 Arrange the prawns, broccoli and tomato in a baking tray. Add pepper, light soya sauce garlic. Sprinkle the cheese evenly on the top and pour the hickory bbq sauce on the cheese. Bake the prawns in a preheated oven at 200 Deg C for 20 minutes or until they are cooked. Serve while still hot. Prawns curry is my all time favourite. The natural sweetness and flavour of prawns blend really well with curry spices. I left the prawn shell intact because they are packed with flavours. Since, I have some leftover cabbage, I throw them into the prawn curry as well. Long bean is a must for my seafood curry because my wife love it very much! In order to reduce the spiciness of the premixed curry spices, I add a tablespoon of serbuk ketumbar (coriander powder) to the curry. My little 5 year old loves curry but it must not be too spicy or else he won't take it. Heat up wok and put in around 4 tablespoons of vegetable oil. Saute blended onions, garlic, ginger and lemon grass until fragrant. Add in the curry and coriander paste. Fry for a short while and add in the curry leaves. Throw in the long beans and cabbage. Add coconut milk and bring to a boil. It the mixture is too thick, add in some water. Put in the prawns, salt to taste and lemon juice. 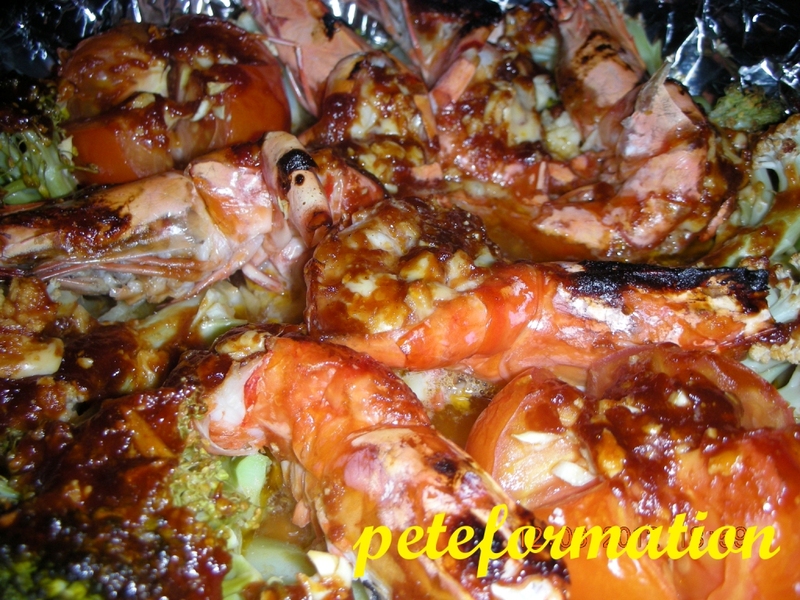 Cook for a short while because prawns cooked easily and they will remain tender when not overcooked. 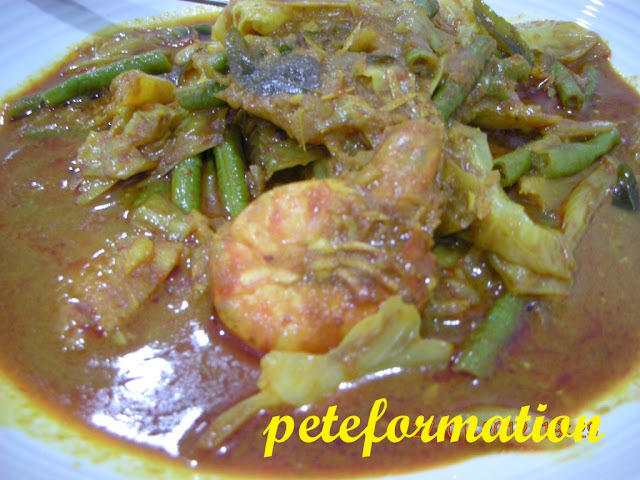 Your "Curry Prawns with Cabbage and Long Beans" dish is ready! Malaysian First Olympic Gold in Badminton? Datuk Lee Chong Wei played a good game against Lin Dan in the London 2012 Olympics badminton finals. But Lin Dan managed to deny us our first gold medal for the Olympics games. Now many Malaysians are wondering, which one of our badminton players will continue the fight for Malaysia's first Olympic gold medal when Chong Wei retires? 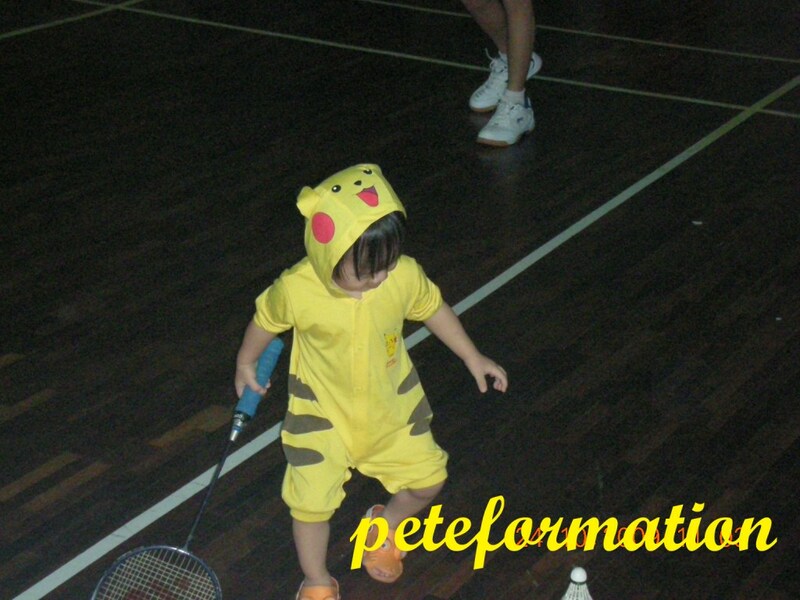 Jeng Jeng Jeng.......enter Peteformation Junior......our future National badminton player and future Olympics gold medalist..............lol!